Why do we think of so many great ideas in the shower? Our brain is relatively quiet with minimal electrical activity. We’re internally focused, letting our mind wander rather than being stimulated by external activity, such as digital screens. We’re in a positive mindset. We’re not directly working on any problems, especially work challenges. As Dr. David Rock explained in his book Your Brain at Work: Strategies for Overcoming Distraction, Regaining Focus, and Working Smarter All Day Long, it’s not the water that helps you get insights. It’s that you break the impasse in the way you’ve been thinking. You’re lathering up while your subconscious brain works in the background. It taps into your stored memories and experiences and connects neurons in new ways for you. Now contrast your experiences like this in the shower with what frequently happens at work. Your prefrontal cortex—commonly referred to as the “executive function” of your brain—is often on overload. You’re trying to juggle a number of thoughts, you’re keeping an eye on your phone as well as the room you’re in, you’re listening to colleagues talking over one another, you all are on deadline to solve a new problem creatively, and you’re anxious about it and several other topics, especially since your boss just scared you about the consequences of last quarter’s performance on your department’s budget. Oh, and you’re hungry. No wonder that only 10% say they do their best thinking at work, according to David. What can you do to improve your focus and your thinking at work? Short of constructing a shower in your cube, start small with some tiny steps. The “will” refers to your motivation to take control of your mind and thoughts. In other words, resolve not to play the victim, letting yourself and your thoughts be hijacked by others. Granted this is easier said than done; however, if you’re willing to become more mindful and more self-aware about what distracts you, you’ve taken a large leap forward. The “skill” is to learn and adopt new behaviors that will help you clear your mind, improve your focus and think more creatively. Consider starting with Tiny Habits®,the innovative program designed by Dr. BJ Fogg. This past week, as a certified Tiny Habits® coach I coached people in a pilot program of Tiny Habits for Work. We designed many of these habits to improve mindfulness, productivity and satisfaction with work. For example, some effective Tiny Habits for Work are taking three deep breaths, affirming what a great day it will be and walking around the office. “Hill” is all about taking steps in your environment to reduce or remove the barriers so you can get over the hill that’s in your way and be more productive. You may not be able to shrink a mountain into a mole hill, but you should be able to start building a path that’s easier to go across. How can you set yourself up for success to think more clearly and creatively? Some ideas that work for others include: Set an alarm so you’ll take breaks every 60 minutes or so to stretch or even better, walk outdoors. Keep a file of cartoons that will make you laugh. Have flowers on your desk. (Or walk to the reception area and smell the flowers.) Spend a few minutes doodling or drawing. Next, you need to experiment to find out what works best for you. To help you do so, join me for the webinar Stop Your Stinking Thinking: 7 Ways To Use Neuroscience To Sharpen Your Mind and Be a More Powerful Communicator and Leader on Wednesday, May 21 at 12 noon ET (9 am Central). The webinar sponsor Communitelligence is offering $50 off when you use the code connect50. Many of the ideas I’ll talk about on the webinar will help you improve your focus and your thinking as well as be more influential. Meanwhile, if you want any help becoming a “showerhead,” contact me. Who says showerheads should be limited to devices that control the spray of water in a shower? 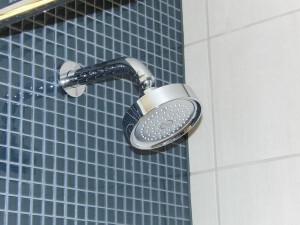 Showerheads also can be those of us who think creatively in and out of the shower. What do you think? Liz: First, I have to say that you have a way with words and images. Very evocative. I’d like to add a fifth element to the four above. I believe that “shower ideas” come not only because of the four listed, but also because your whole body is being stimulated by the warm water hitting many body parts at once. I’m a strong “believer” in the mind/body connection from personal experience. That stimulation isn’t something we can experience at the office unless you bring in a masseur, which some do. (I once had an office in an old mansion and the shower in it had seven heads, one above, and three down two opposite walls. Now THAT is a shower. I had more than a few in it after my noon run/walk(s)). Thanks, Paul. You make a great case for getting the body involved. I’ve not seen research specifically about getting insights in this way. Wish we could use the shower in your old office as a research lab! Plus add massages too. Meanwhile, hope you can keep up this stimulation, which works so well for you.